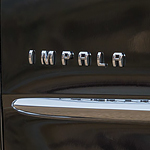 The Chevrolet Impala has become one of the more popular full-size sedans available for car buyers today. As a brand that is committed to safety, this vehicle is no exception. For comfort, style and safety, take a good look at the Chevrolet Impala. Safety features on this vehicle help keep both the driver and any passengers safe. If you begin to drift outside of your marked lane, the lane departure warning light will let alert you. This keeps you from drifting off, especially on long commutes. The collision alert system warns you of potential crashes, and alerts you if it senses you are too close to the car in front of you. At Edwards of Storm Lake, we are ready to take you out for a test drive in a Chevrolet Impala and show you why this vehicle has become a favorite of many drivers. Visit us today to learn more about this vehicle.